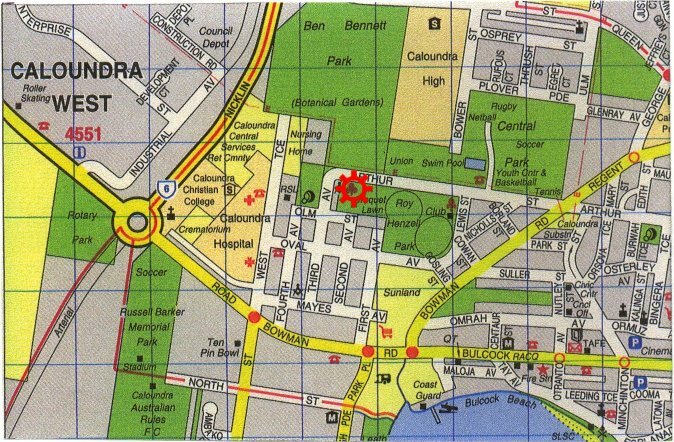 The Club House is situated in Arthur Street, Caloundra, in a wide expanse of green area adjacent to the Croquet Club. If you are approaching the club from the Bruce Highway and travelling along the Caloundra Road, you will go round a number of roundabouts. The third roundabout is the intersection between the Caloundra Road and Nicklin Way. Go through this roundabout and turn left at the next intersection into West Terrace, heading towards the Caloundra RSL Club. Take the second turn on the right into Oval Avenue and then the second turn on the left into Third Avenue. Continue along this avenue until it takes a right angle turn into Arthur Street. After about 50 metres, you will find a paved lane on your right leading up to the Caloundra Contract Bridge Club building. If you are approaching the club from the Nicklin Way, travel south down Nicklin Way until it intersects with the Caloundra Road – the main road into Caloundra from the Bruce Highway. From the roundabout, follow the directions as detailed above.